When our kids were too small to carry their own luggage, we’d pack their clothes in with ours in the rolling suitcases we got for our wedding. As the kids grew and needed more of their own space, we gave them roller bags. Although it was nice for each of us to have our own bags, roller bags were not ideal for the way we travel. We almost always travel in the minivan. On road trips, we would get to our hotel, check in, put the bikes in the room and then make additional trips to the car to get 4 heavy roller bags. An extra trip to the car doesn’t seem like a big deal, but after a long travel day, neither grumpy kids nor exhausted parents wanted to take extra steps. Last year, we started the research to find the prefect travel bags for our family. We quickly decided on duffel bags instead of suitcases because of their flexibility, light weight and potential for freeing up your hands with the addition of backpack straps. 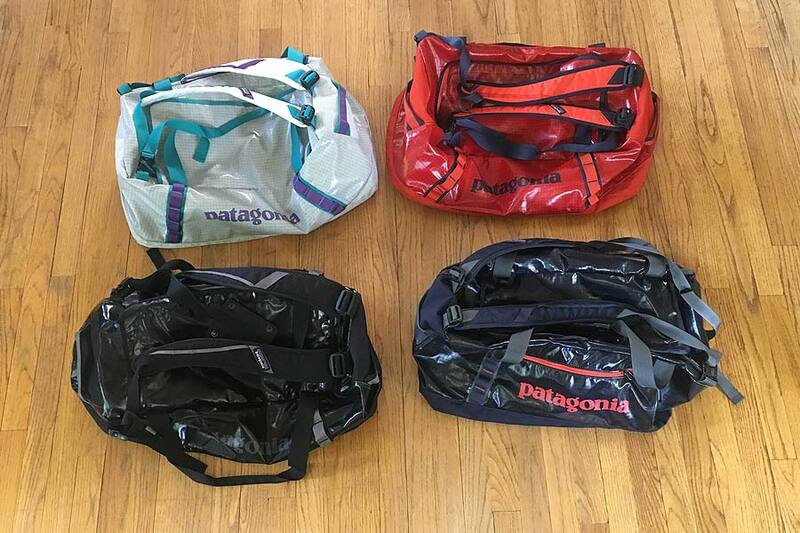 After reading hundreds of reviews, we purchased Patagonia 60L Black Hole Duffel bags. Over the past couple of years we have used our Black Hole Duffels for all of our long and short trips. One of the best features of these bags is that they come in a variety of colors. We purchased four different colored bags so each of us knows which bag is ours. This is helpful when rummaging for one particular bag in a packed mini-van and also lets each of us take care of our own supplies. Despite over 2-years of being used by our rough and tumble boys, they still look like new except for some very minor scuffing. Exactly How Much Stuff Will Fit In This Thing? A bonus! Since we live in the desert, our bags are more likely to get splashed with Gatorade or splattered with mud than doused in a rainstorm. Despite that, it’s nice to know that the bags will keep moisture out and can be easily wiped off in case of unexpected spills or storms. These bags are tough! They have been packed to the brim, dropped and tossed onto the ground, and dragged on the asphalt. Amazingly, our Black Hole Duffels have no rips, tears or even noticeable worn spots in the rip stop laminate fabric despite the rough handling. 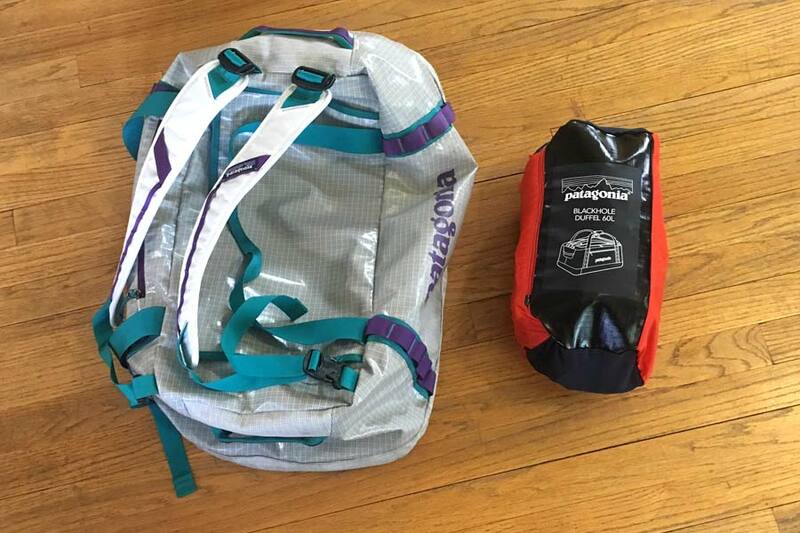 Patagonia Black Hole duffel bags come with removable backpack straps which make them much more convenient to haul around than a suitcase. This feature frees up our hands to wheel bikes and carry luggage simultaneously. The shoulder straps are padded and comfortable. The carrying handles on the top of the bag are long enough to easily sling the bag on your shoulder if needed, but not nearly as comfortable as the backpack straps. There are also sturdy carry straps on both ends and daisy chain attachments to connect gear/helmets to the outside of the duffel. Don’t let the people online who say the straps are hard to attach scare you! These straps are easy to attach (see video of our 11 year old attaching both straps in less than 20 seconds). 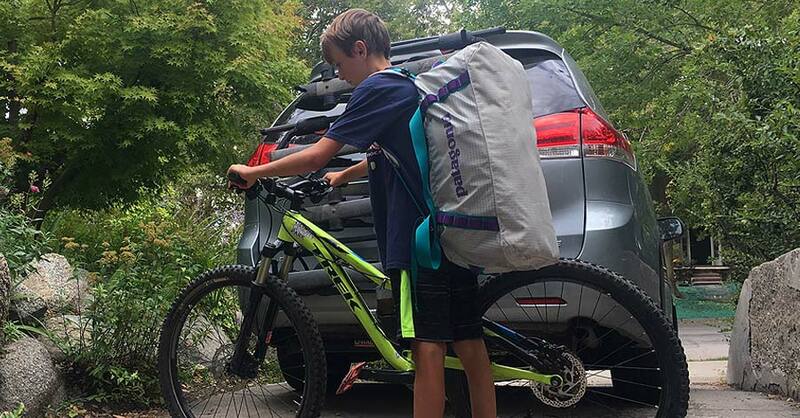 The capacity of the 60L duffel bag is perfect for bringing all of our mountain biking clothes and accessories for a weekend or longer trips. It’s big enough to hold each family member’s belongings and small enough to be packed into the hotel by a 9 year-old. There are two zippered compartments on the top of the duffle and a single side pocket that is accessible from both the inside and outside. These duffels hold everything we needed with room to spare. But wait, there’s more! As if the above benefits weren’t enough, the entire bag (including straps) folds down into its own inside pocket. Great for storage! 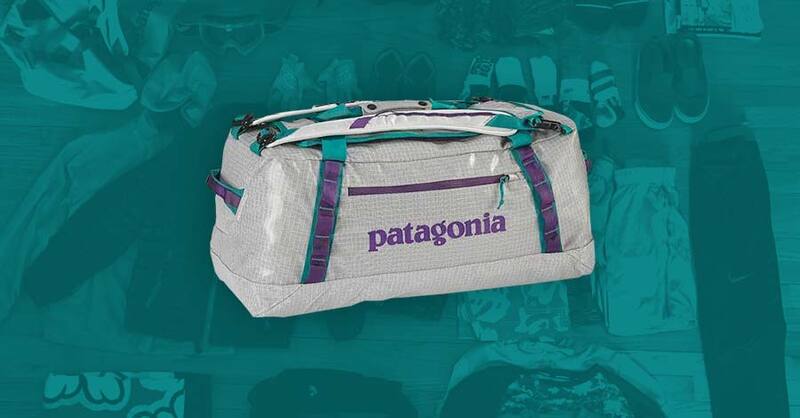 Our family 100% recommends the Patagonia Black Hole 60L Duffel bag. 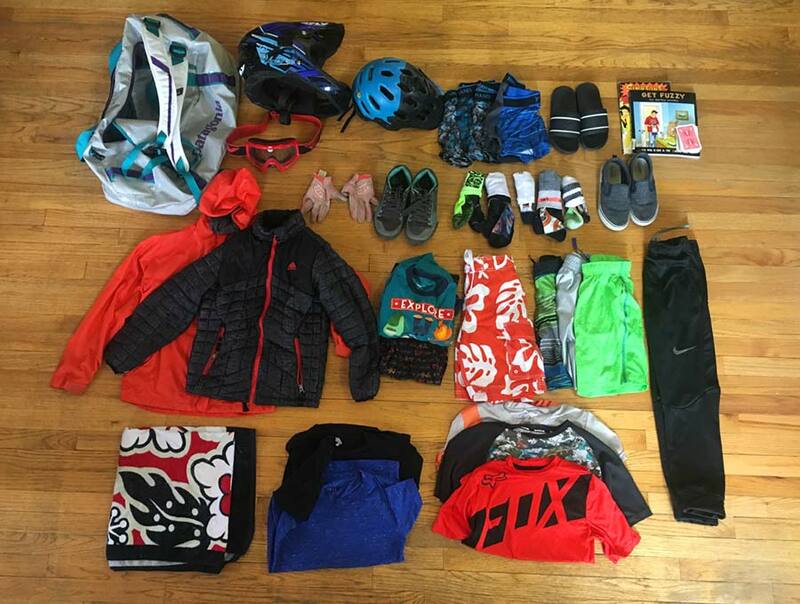 It’s the perfect bag for our family mountain biking excursions. The only thing I would change about this duffle is a larger top opening. The main top opening isn’t the same size as the bag dimensions. This means that you have to pull more things out to find items that might not be in the center top of the bag. However, this is only a problem when the bag is packed completely full, which is usually not the case.